Here is the latest inkling that I did for my Ranger Inkling yahoo group. 1. 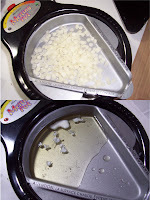 Following directions for melting bees wax melt some in melting pot using melting pot project pan. You can find tips for melting bees wax on the Ranger site. 2. Place chipboard into melted wax. Use melt art tools to remove chipboard from wax and place on non stick craft sheet to cool (be careful not to get hot wax on you). Once cooled use a paint brush or sponge to brush more wax onto the chipboard. Let wax cool. 3. 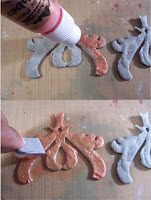 Dab on copper paint and then use a piece of cut and dry foam to remove excess paint and blend. 4. 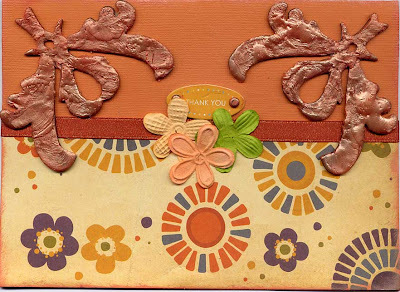 Make card using cardstock and patterned paper (or use pre-made blank card). :”Ink” the edges of the card with the paint dabber. Decorate with wax covered chipboard and other embellishments.